During the past couple of weeks, I've been working on the monster as always. The AI work has been slowing down since I've had to look up how to alter some of the pathing. 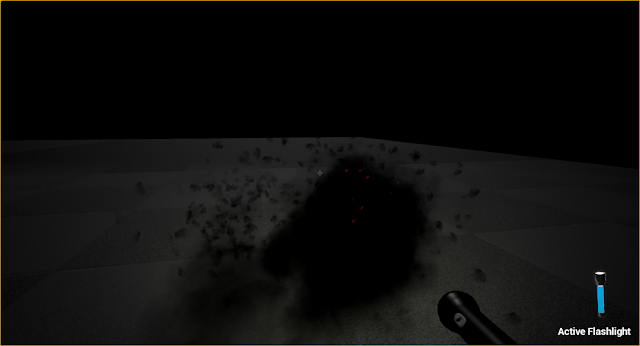 In the meantime, I've also started working on the particle effects that make up the monster. I think I've made some pretty good progress so far. When I asked the artists on the team for some guidance on how the monster should look, they brought up images of schools of fish, and various swarms of animals. Following that idea, I added an additional emitter that created tiny particles to erratically orbit the monster's origin point. The original cloud of smoke now had what looked like a swarm of insects buzzing around it. 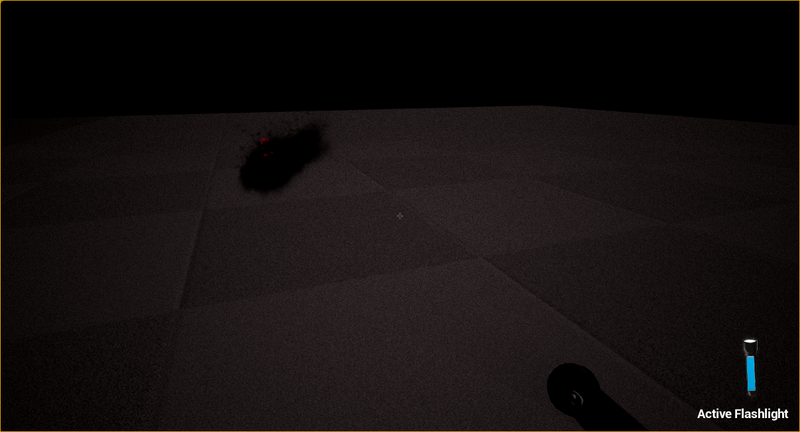 Next, I decided to try and fix a simple problem: Because the monster is entirely black, it's nearly impossible to see against a dark backdrop. I needed to find a way to make the monster visible while still being creepy. 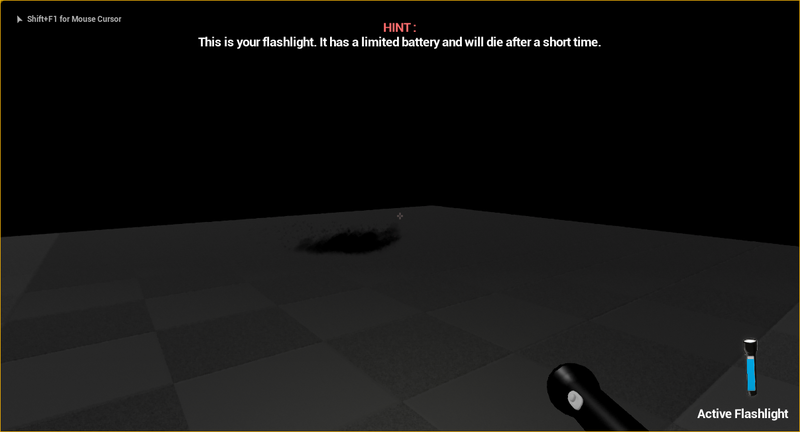 One of the original concepts that spawned this game was the common fear of the dark. That concept led me to try and make the monster create glowing 'eyes' within its mass, both to add to the creepiness factor and to make it more visible to the player. I got some useful feedback in class. My teacher showed me some videos of snakes, barracudas, and other 'long' predatory animals to help make the monster seem more dynamic and alive. I've taken her feedback into consideration, and made a few interesting changes. My first change was to "give the monster legs", as I like to call it. As you can see in the screenshot above, the monster's main mass actually falls now, and sits on the ground. 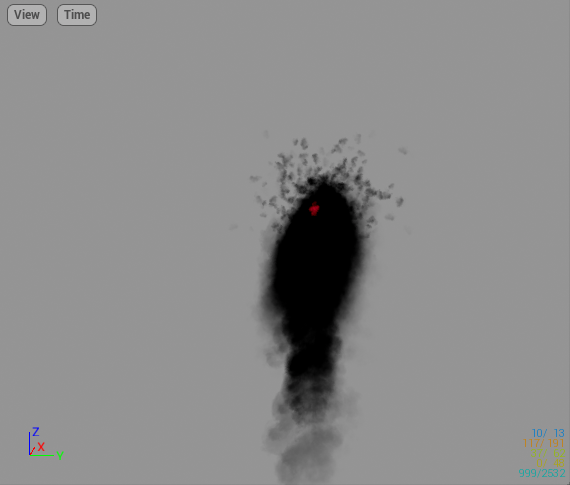 The result is that the monster seems to actually drag its body across the floor, rather than simply float like a cloud. It also serves to almost make it feel more like a creature, by giving it what looks like a discernible head. After that, I started working on making its state more visually obvious. I started off by making the monster's size depend on a variable that I could alter. When the monster charges the player, it becomes thin and agile. When it runs away, it puffs up to look more intimidating. This change alone makes it feel more interesting and alive. The monster going in for the kill. Believe me--it's creepier when it moves. 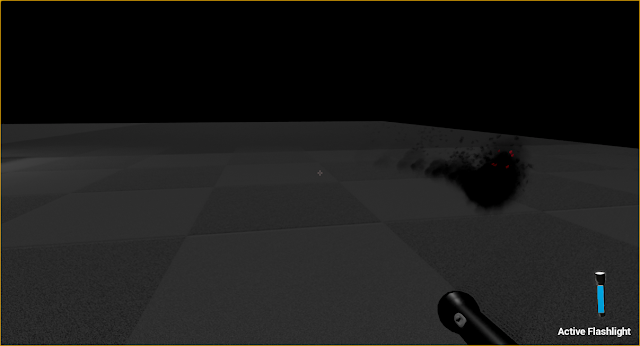 With the size changing in place, I began working on giving it some more interesting movement as well. When attacking, the monster now undulates along two sin waves. Each axis (horizontal and vertical) has a slightly offset multiplier and length. The result is desynchronized movements that make it look both dangerous and a little bizarre. As a little teaser, here's some updated damage feedback.